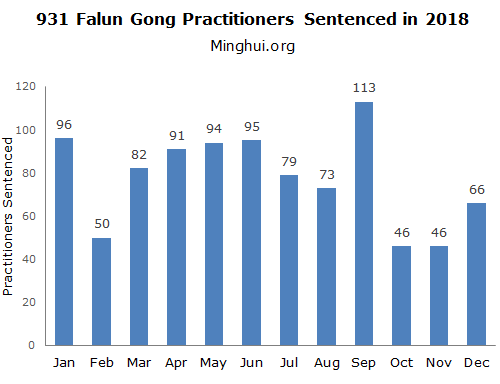 According to information collected by Minghui, 931 Falun Gong practitioners were sentenced to prison for their faith in 2018. These sentenced practitioners come from 27 provinces and centrally-controlled municipalities. 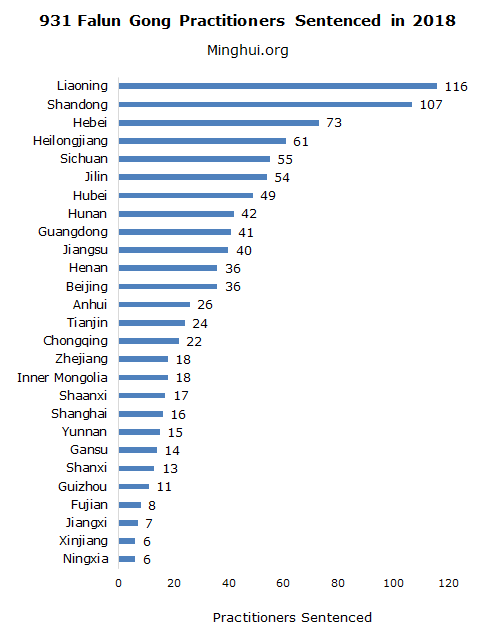 Liaoning Province led the list with 116 sentences, followed by 107 convictions in Shandong Province. Both provinces also topped the list of sentencing cases in 2017, with 179 and 108 cases, respectively. Twenty-one other provinces reported double-digit sentencing cases, ranging from 11 to 73. Four provinces reported between 6 and 8 sentenced. The prison terms of these practitioners range from 4 months to 14 years, with an average of 3.22 years. The 14-year-sentence was given to Mr. Song Zhigang, a resident of Liaoning Province, in April 2018, after the police found Falun Gong-related information in his lost cellphone. Another practitioner, Mr. Liao Dawu from Guangxi Province, was sentenced to two years on December 28, 2018, for accompanying the husband of a detained practitioner to visit her. Ninety-five of the practitioners are 65 or over. Ten in their 70s were sentenced to 7 years, and four in their 80s were sentenced to 4 years. In addition to the prison sentences, 258 practitioners were either fined by the court or the police extorted funds from them for a total of 2,880,577 yuan, with an average of 11,165 yuan per practitioner. 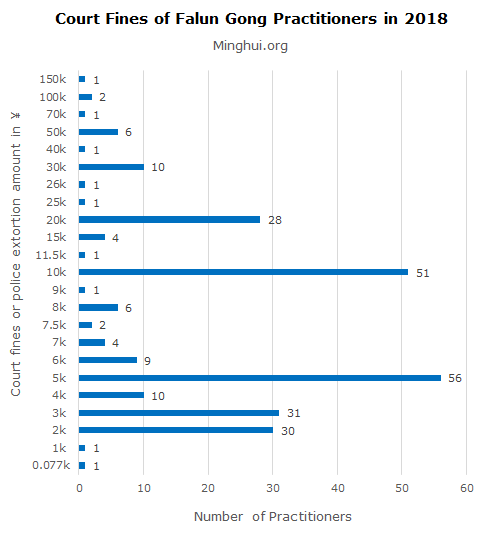 Due to the Chinese communist regime’s information blockade, the number of Falun Gong practitioners sentenced cannot always be reported in a timely manner, nor is detailed information readily available. The actual number of practitioners sentenced may be higher. The practitioners sentenced in 2018 include college professors, engineers, IT specialists, and entrepreneurs. While they enjoyed successful careers, they were still given prison sentences for not renouncing their faith. Many of them credit Falun Gong for giving them more energy and wisdom to do their work better. Mr. Ma Zhenyu, a radar design engineer in Nanjing City, Jiangsu Province, was sentenced to 3 years in prison on June 28 for writing letters to government officials to appeal for Falun Gong. He is currently serving time in Suzhou Prison. The authorities retaliated against Mr. Ma’s appeals lawyer for representing him and other Falun Gong practitioners by threatening not to renew his license. Another lawyer also received a warning and was threatened with having his license revoked should he continue to represent Mr. Ma. The third lawyer who continued to represent him was prevented by the authorities from meeting with him. Mr. Ma’s wife, Ms. Zhang Yuhua, also a Falun Gong practitioner, fled to the U.S. three years ago to escape the persecution and is unable to return to China. She is now very worried about him, as no lawyer has been allowed to meet with him since he was incarcerated in June 2018. Mr. Xu Yongqing, an engineer in Shanghai, was sentenced to two years in prison and fined 5,000 yuan on September 18, 2018, for not giving up his faith in Falun Gong by a court in Yangzhou City, Jiangsu Province. Mr. Xu’s ordeal began on August 22, 2016, when he was arrested for requesting the removal of a bulletin board with messages defaming Falun Gong near a subway station in Shanghai. After he was released, he filed complaints against the officers who arrested him and the Ministry of Public Security for supporting the persecution of Falun Gong. The Ministry of Public Security ordered Shanghai police to make Mr. Xu drop his lawsuit. He refused to comply and later faced retaliation by the police, who accused him of mailing letters about Falun Gong. Dr. Li Changxing, 59, a physician in Guangzhou City, was sentenced to four years via video conferencing in a detention centre on September 6, 2018. Dr. Li was arrested on April 20, 2017, for tearing down posters defaming Falun Gong. After several months of detention, his medical conditions due to heavy poisoning that disappeared after he started practicing Falun Gong recurred. As the authorities denied him medical attention, his health kept declining, and he was in and out of consciousness. He was emaciated and became unable to stand or walk. 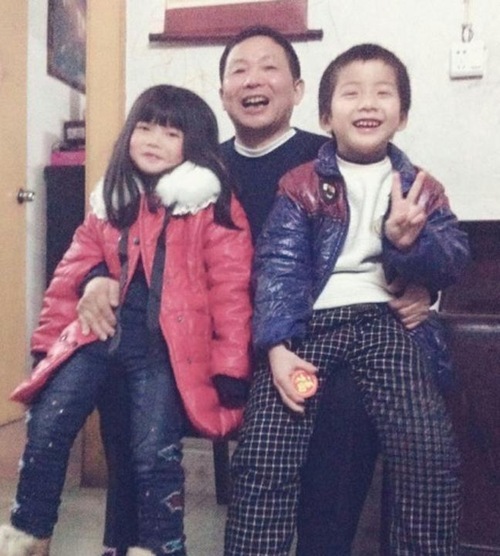 Dr. Li Changxing, a physician and father of two, was recently sentenced to four years in prison. Ms. Li Ping, 49, a former executive in charge of medical ethics at the Jiagedaqi Railroad Hospital in Heilongjiang Province, was sentenced to two years in prison in October 2018 for writing letters to government agencies in an attempt to persuade them to stop persecuting Falun Gong. Ms. Li was tried on June 5, 2018, and only two family members were allowed in the courtroom. When Ms. Li started to argue that her letters merely explained why the persecution of Falun Gong was illegal and that she hadn’t broken any laws, judge Kong Linghong stopped her. Judge Kong found Ms. Li guilty not long after the hearing and sentenced her to two years in prison. 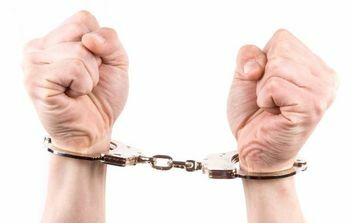 In 2018, some practitioners who were targeted in mass arrests in previous years received prison sentences, while others are still awaiting verdicts or are in different stages of prosecution. One year after a mass arrest of 37 Falun Gong practitioners in Tianjin on December 28, 2017, three of the practitioners were sentenced to prison for not giving up their faith. Five more are awaiting verdicts after court hearings, and six are facing indictment after their arrests were approved by the procuratorate. Ms. Feng Junling was recently sentenced to 10 years in prison in the Binhai New Area Court. Ms. Huang Junjuan was sentenced to 7.5 years and fined 10,000 yuan by Wuqing Court on September 17, 2018. She has appealed the verdict. Ms. Jin Zhi was sentenced to three years by the Beichen District Court in late September 2018. She was taken to Tianjin Women’s Prison to serve her time. Eleven of the twelve Dongzhou District, Fushun City, practitioners arrested in one day more than two years ago were sentenced to prison in December 2018. The remaining practitioner is awaiting a verdict following a hearing. They were arrested on July 22, 2016, during a month-long police sweep of local Falun Gong practitioners. The 12 practitioners appeared in court between September and November 2018. Eleven of them were sentenced to prison in early December, with an average term of 3 years. Ms. Xu Guirong is still awaiting a verdict after a hearing on September 10, 2018, in the Wanghua District Court. Ms. Sun Zhongfang, an 80-year-old Falun Gong practitioner, was sentenced to 4 years in prison by the Beijing Fengtai District Court on December 28, 2018. A court official went to her home to announce the verdict. 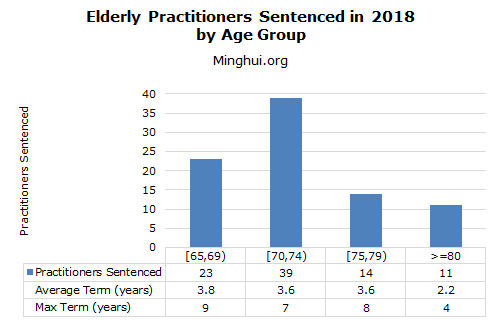 Ms. Sun was arrested with six other practitioners (including four in their 80s) on May 8, 2018, when they were reading Falun Gong books together. Even though Ms. Sun was released on the day of her arrest, the police proceeded to file charges against her. Ms. Tang Tianzhen, a 75-year-old resident of Chongqing, was sentenced to 3.5 years in prison in early December 2018. She was hospitalised for 13 days after she was ordered to go through an intensive “training program” at Chongqing Women’s Prison aimed at making her renounce Falun Gong. Ms. Tang was arrested on June 6, 2018, for talking to people about Falun Gong. Her family was kept in the dark concerning her whereabouts until August 22, when they received a phone call from Longyan Detention Centre. The detention centre only allowed them to send her clothes but not to see her. Mr. Wang Xianghui, who lives in Hebei Province, was sentenced to 21 months in prison on December 25, 2018, after serving 11 years in prison for intercepting TV signals to spread information about the persecution of Falun Gong between 2002 and 2013. He was near death several times as a result of severe torture in prison. Mr. Wang’s latest arrest came only five days after his mother, Ms. Liu Guipu, passed away after becoming paralysed and bedridden for five years as a result of torture during her seven months of detention for practicing Falun Gong. His father, Mr. Wang Pingjun, was also repeatedly arrested and sent to labor camps for his faith. He was fired from his job 16 years ago and denied his pension. Nearly 70, he is still doing odd jobs to make ends meet. After Mr. Wang’s sentencing, his elderly father was the only one left to take care of his son. His police officer wife was forced to divorce him more than 10 years ago due to the persecution. Mr. Shi Zaihe, 47, was sentenced to 5 years in prison and fined 20,000 yuan on December 13, 2018, for filing a criminal complaint in 2015 against Jiang Zemin, the former leader of the Chinese communist regime who ordered the persecution of Falun Gong in 1999. Mr. Shi had moved repeatedly for nearly three years before his arrest in March 2018 after being put on the “most wanted” list for filing the complaint. The police monitored the phone calls of most of his family members and friends to try to track him down and arrest him. He wasn’t able to return home even when his mother passed away. Prior to his latest ordeal, Mr. Shi also relocated frequently between 2001 and 2003 to avoid arrest. He served two years in a forced labor camp after the police arrested him in a city 330 miles from his home. Guards shocked him with electric batons, dragged him back and forth on the ground, stepped on his feet, and beat him with a shovel—all in their attempts to force him to renounce Falun Gong.